The Oregon State Capitol, located in the state capital Salem, OR, houses the state legislature and the offices of the governor, secretary of state, and treasurer of the State of Oregon. Outgoing postcard US-3202770 to Austria was a vintage linen postcard, published by E. C. Kropp Co., showing "Pride of the city of Salem, community center of the verdant, prosperous mid-Willamette Valley valley region, and pride of all Oregon - is the majestic new capitol building. A tribute to the achievements of the past as well as to the forward vision of present day Oregon, this building was erected when fire destroyed the original edifice in 1935." 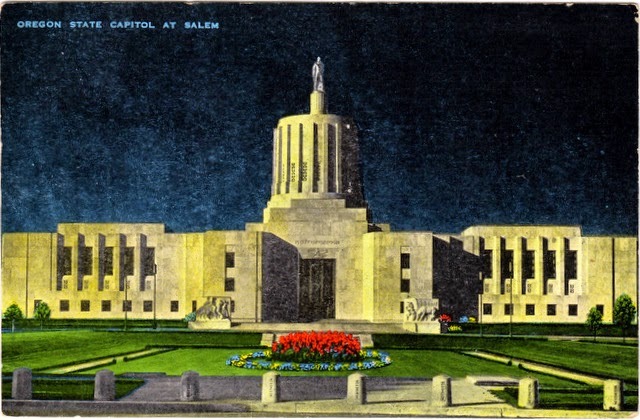 Constructed from 1936 to 1938 and expanded in 1977 as the third state government buildings in Salem, it was added to the National Register of Historic Places in 1988.